Enjoy a hearty breakfast at the hotel and leave for a half-day sightseeing tour to the hilltop fortress of Amber. A small trek up the hill will be covered while riding an elephant in the royal manner. The fort was built in 1592 under the reign of Raja Man Singh and was later modified by successive rulers for next 150 years. Today the structure stands with its beautifully carved ceilings, intricate patterns and stunning designs. 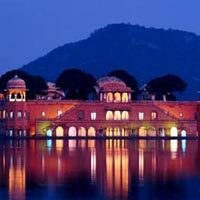 In the afternoon, tour the old walled city of Jaipur. Overnight stay in Jaipur.